Prophecy Clock – Is It All Over within 23 Years? If you follow the One Year Bible, you just finished reading Luke 21, today. That chapter contains a prophecy about the Last Days that indicates when the they begin, and – more importantly for us – when they end. So, let’s talk about Luke 21, and why it is so important to us. That title represents an extremely shocking question, and more than a little difficult to swallow. Could we really have only 23 years, or less? Well, a close examination of Luke 21 appears to leave us without any other conclusion. So, let’s look at it. After that horrifying statement, Jesus then launched into a description of the next 40 years. And, as we know, everything happened exactly as He described – especially with the destruction of Jerusalem and the Temple – in AD 70. The people referred to here were the Jews, and for 1900 years, they were scattered to literally the ends of the Earth. And, Jerusalem was indeed controlled by the non-Jews for that entire time. And then… after that 1900 year period… something happened. The period of time allotted to the Gentiles fulfills. To put it another way, the period of time set aside for them is finished. The word ‘fulfilled’ is the same one used when talking about fulfillment of prophecy. On June 7th, 1967, Colonel Motti Gur cried out three words to General Narkis, and to the world, “haHar haBayit b’Yadenu!” (The Temple mount is in our hands). And, it marked the end of Gentile control of Jerusalem. There is a picture running around somewhere of an Israeli flag flying from the top of the Dome of the Rock. That flag was ordered taken down by Moshe Dayan, but it remains as an incredibly symbolic moment in time. So, can we say that Jerusalem is no longer ‘trodden down of the Gentiles’? How do we know when someone is in control of something, in this day and age? When you break the law in America, you go to an American court and you are penalized under American law. When I break the law here in Taipei, I go to a Taiwanese court and am penalized under Taiwanese law. What happens when you break the law in any part of Jerusalem, including the Temple Mount? You go to an Israeli court, and you are penalized under Israeli law. 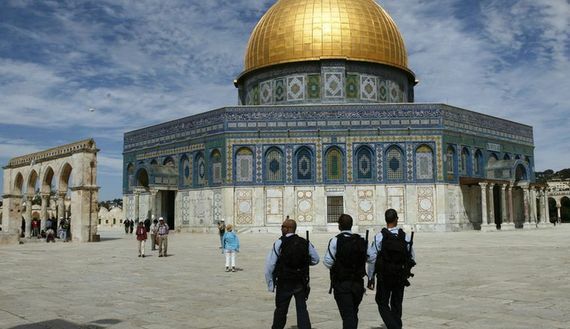 Israeli police officers walk in front of the Dome of the Rock, on the Temple Mount. Does that give you an idea as to WHO rules over the Temple Mount, and the law that prevails over it? Yeah. It’s Israeli law, applied in Israeli courts. If you violate the law of Israel on the Temple Mount, you pay an Israeli fine or go to an Israeli jail. Is there anyone ELSE who governs the Temple Mount? No. Of course not. Otherwise, the Palestinians wouldn’t be nearly as desperate as they are now, to get control of that place. However, please understand that Jesus specifically made the connection to Jerusalem, and I find that the be particularly significant. He was saying that Jerusalem was the key, not the Temple. So, there will be a generation that sees these things come to pass… and, it appears that THIS generation will not pass away. THAT is the Last Days in a nutshell. So, how much time do we have left? So, it looks like we have a maximum of 23 years left. So, will everything happen by 2037? Well… it could be all over with, even more quickly than that. Missed you yesterday, but we all need a rest now and then. Rest and reading the Bible helps restore the mind, body and soul. I think we have less than 23 years, because the US is near economic collapse, Russia, China and Germany (EU) are rising, after Ukraine, a war in Syria is near – destruction of Damascus. Elections are scheduled in Syria on June 3, 2014. Syrian peoples’ favorite man, Bashar El-Assad, is going to win re-election. The US and NWO do not want this. Ukraine and Malaysian flight MH370 are distractions. Things are heating up in the Middle East. Remember the MSM ( Cable – Satellite TV, Print and Internet media) are controlled by the global elite/Rothschild banksters to feed the sheeple SOMA. This is brainwashing, dumbing down, keeping people entertained/distracted and compliant. President Obama is finished in January 2017 unless he imposes martial law by a false flag event like 9/11 or Sandy Hook. Pope Francis continues his Jesuit/Illuminati work to destruction. A One World religion, political and economic system is very close. And America’s downfall and war in Syria is the key. America’s downfall must be blamed on someone else other than the Banksters. Then again as in WW1 / WW 2 and crash of 1929 and 2008, money and power will be consolidated in fewer and fewer hands. Technology, military, economic and political power are in fewer hands. The stage is set and God’s plan , through Satan, Antichrist and the False Prophet, will be fulfilled. God is in Control. Amen. Blessed be God forever: in Jesus’ name – Allejuliah! Thanks, Norbert. Whew! That was a lot, but very well said. Just remember that things have a tendency to go awry for the poor Satanists, so things really could take the full 23 years. But, I also think that things will move along faster than that. We’ll see. The Palestinian Academic Society has also put forth the date of June 28, 1967, as the date that Israel stole Jerusalem from the Palestinians by annexing Jerusalem. The “decree” passed on June 28, 1967, is the SECOND “decree” “to restore and rebuild Jerusalem”, referenced in Daniel 9:25. Jesus Christ, “the Anointed One, the ruler,” will come again “seven ‘sevens,'” (forty-nine years) after that “decree”. Jesus Christ will return in the ONE YEAR WINDOW OF TIME, of the FORTY-NINTH YEAR following that “decree”. The “decree” on June 28, 1967 to annex Jerusalem, occurred in the ONE YEAR WINDOW OF TIME, of the Jewish calendar that began on September 14, 1966 (Rosh Hashanah 1966), and ended on October 4, 1967 (Rosh Hashanah 1967). FORTY-NINE YEARS from June 28, 1967, is June 28, 2016. From September 13, 2015 (Rosh Hashanah), until October 2, 2016 (Rosh Hashanah), is the ONE YEAR WINDOW OF TIME, of the forty-ninth year (seven ‘sevens’), since the second “decree” “to restore and rebuild Jerusalem” occurred on June 28, 1967. JESUS CHRIST, the Anointed One, the ruler WILL RETURN IN THE ONE YEAR WINDOW OF TIME THAT OPENS ON SEPTEMBER 13, 2015, AND CLOSES ON OCTOBER 2, 2016! I’m sorry that I had to clip the article, but I really need comments to stay around 300 words – so that others have a chance to participate. Since it looks like you were posting an article, could you please provide a link, instead? Now, as to your point… You have produced an impressive numerological analysis, but it is in conflict with the rest of the Bible. The Bible is pretty clear that Jesus would not return until AFTER the Antichrist comes. Thank you for that comment, Steve. Interesting points. I only recently discovered your site and have been challenged by your writings and impressed by your humble spirit!! Just wondering about some things. When I read Luke 21 my understanding is that the generation mentioned in vs 32 relates to the fig tree- ie Isreal- in vs 29. In that case 70 years would be added to 1948 bringing us to 2018. As well if you calculate the generations mentioned in Matt 1 you come up with a generation of 51.5 years. Interesting that if you add 51.5 to 1967 when J’salem was recaptured you again arrive at 2018. Is it the end of the tribulation? The beginning? God knows! Whatever the case may be may He find us faithful when He returns! It is certainly possible to make that inference (i.e., 1948), except for the fact that Jesus specifically mentions Jerusalem – and that Jerusalem has always been THE symbol of Israeli sovereignty over The Land in the Old Testament once David captured it. It’s interesting also the many articles on “generations”, if a generation is birth to birth model it seems 40 years is a generation (you can search term “what is a generation in the bible” and read many with verse backings as to how they arrived at the time span etc), and up to 70 years, clear up to 100-120 years. with the quickening advance of dark knowledge (or used in that way), gene splice, nano tech, trans species, trans human..lots more, it’s hard to see another 23 years left, they’d be living on mars by then? but the prophesies don’t mention the Lord stopping off at mars before His return here etc. But I dunno. I have looked at the prophesies with that specific idea in mind (what does man “look” like when the Lord returns, what is he, what does he do, what tech advancements does he live with etc) and he seems alot like menkind today..so does something stop their march to transhuman techno utopia? massive famines and a “sending them back to the cart and horse ages”? but wouldn’t their more secret tech advance still go on? It’s interesting anyway. Now re-do your math. Still, don’t forget Jesus comes back when He does because if didn’t come back then, “no flesh would live.” Chem Trailing alone will kill everything within 3 years if you believe the experts. With all the nukes, bio stuff, chem trailing, blood moons, and the fact that THEY must act before everyone’s informed … we have way less than 23 years. That indicates a 70 year time span of life. However, I am putting that number out there so that people understand that there is a maximum limit of 23 years. If you start subtracting everything else that must happen… well that number shrinks – rapidly. I am certainly NOT dogmatic on the 23 year number – not by a long shot. Thank you, Josey, for keeping me honest. I have enjoyed your educated readings over the past several months after having stumbled upon your page. Your most recent post about the return of Jesus according to the Scriptures is also covered in the fig tree prophecy on http://www.nowtheendbegins.com Can you offer any commentary or corroboration on this interpretation? As I’ve said to others, I do not believe that the ‘fig tree’ analogy refers to the creation of the state of Israel. Jerusalem has always been the ‘battle ground’, and I think that Jesus was making a very specific reference to Jerusalem. And, I believe that we should pay attention to it. And, it certainly looks like events are playing out in accordance to the Jerusalem timeline, more so than the ‘Birth of the State of Israel’ timeline. That thought HAD occurred to me, but I wasn’t sure if there was enough Biblical foundation for it. And yes, a very, VERY curious coincidence. Having said all that, my feeling is that Jesus was referring to ‘actual life span’ – meaning, that if you see the one… you will see the other. We’ll see. As you said earlier, this will undoubtedly move much more quickly than even 23 years. I’m like you, a generation-life span is 70 to 80 years. [Psalm 90:10] Has been since the time of David. Unbelievers mock and say in the middle ages people only lived to their 40s. But many back then died in infancy, and that brought the “average” down. I think the fig tree in Mt. is referring to the nation of Israel. Within are good and bad figs, see Amos. In national Israel, there have always been elect and reprobate. And holds true today, right up to the LORD’S second coming. A parable-riddle is not easy, but comparing scripture, the fig tree here is Israel. At least in my mind. She became a nation again in 1948, and 80 yrs. at the most would be 2028. We know there is quite a bit of prophecy to be fulfilled, before the Pre-wrath rapture. But once Eze.38-9 comes to pass, things will change and happen very quickly. I love what you wrote about Jerusalem in Luke 21. There is no contradiction here, simply looking at both accounts. Also, I think the incarnation of Jesus Christ was probably around 5 BC., so 33 years later at His ascension would be 28 AD. We know 1000 yrs. to us is but one day for the LORD. Is it possible that the believers could enter the Sabbath-day rest millennium somewhere around 2028-30?? I’m not super dogmatic about all this, but it’s very interesting, especially if one considers the following.